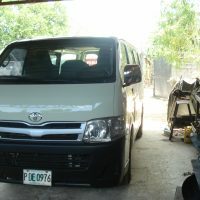 From a total wreck, the busito has been repaired and is ready to return home. After the accident six months ago, I thought the poor thing would never run again. The vehicle looked like a crushed tin can (see January posting). But here it is, as good as new. 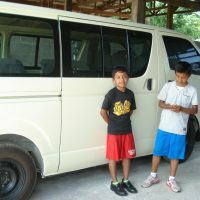 Both boys in the pic, Anael, and Oscar, were injured in the accident. They showed me where they had been sitting that fateful day on that steep, rainy, slippery dirt mountain road, a deep abyss on either side. 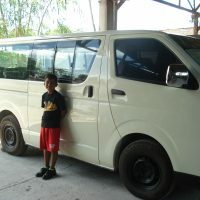 None of the 15 people riding in the busito, kids, and adults, suffered severe injuries. The repair job cost $5,000 but there is still money owed before it will be released to the Children’s Home. I realize very few people read this web page, however, if by some miracle some generous benefactor who is reading this page has $1,000 to spare, it would be more than welcome. Gracias. This entry was posted in Everyday on 30. July 2018 by Fortunato Velasquez.